Hello, Paul Prout is my name from Toro Australia. Today, we're going to introduce the new Toro BRC28, which is a brush cutter mower it is. 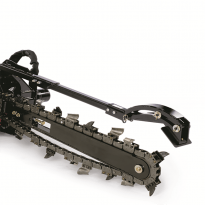 It will handle up to 30-millimeter saplings as well as small brush, as well as grass. One of the key features of the product is actually the oscillating head, I'll lift it up and show you now. The main purpose of that is so when you're on a hillside mowing, the head will actually turn to stop the machine or minimize the machine from tipping over, it will do. It's also a hydrostatic drive, so there's no gears, so it's easily to be able to operate for the operator with just a slight movement of that control there, you can go as slow as you want it to go or as fast as you need it to. It's also a key start, so there's no pulling with the hand which is obviously very user friendly for the hirers. 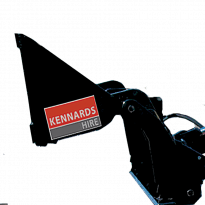 For more information on this product, you can visit Kennards Hire. To be used in conjunction with the Mini Loader. A bucket, blade, grab and leveller all in one. To be used in conjunction with the Mini Loader. 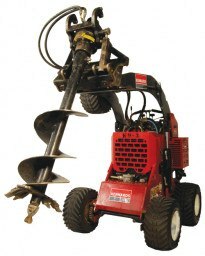 Auger attaches to post hole attachment, ideal for digging post holes through soil and clay. To be used in conjunction with the Mini Loader.